As the opening volley of “New Krypton,” this annual sized one-shot picks up right where recent events in Action Comics left off. When a revitalized Brainiac made off with the bottled city of Kandor, then shrunk and bottled Metropolis in the same manner, Superman was forced with a tough decision. Naturally, he was going to stomp the villain, but once both cities were back in his possession, could he really return Metropolis to its regular size without offering the same luxury to Kandor? Ultimately, the Man of Tomorrow decided he could not, and appropriately returned it to a respectable size. Which now asks another question: what to do with a hundred thousand native Kryptonians? Oh, and did I mention that in the process, Brainiac also managed to strike an indirect killing blow to ol’ Blue’s adoptive human father, John Kent? Each member of the Man of Steel’s writing staff has joined forces for this bulky volume: Action Comics author Geoff Johns, Superman scribe James Robinson and Supergirl writer Sterling Gates share collaborative writing duties. Their collective writing is invigorated with good ideas, if a bit scattered and occasionally confusing. The heart of this material, though, is good stuff. Together, they’ve turned Brainiac into a genuinely interesting, challenging foil for Superman, finally expanding his rogue’s gallery beyond Lex Luthor. Every time the bad guy’s in the scene, there’s an unspoken tension that leads us to believe he means business this time, that he can finally make a dent in Clark’s thick armor. Kent, meanwhile, is both mourning the loss of his adoptive dad and dealing with the sudden existence of a legion of life-sized Kryptonians, each of whom is developing powers to rival his own. I wasn’t sure DC would ever do something with this long-bottled city, let alone the right thing, but this team of writers is handling it excellently and it feels like a landmark event in the big man’s long history. While everything is peachy keen on the Kandor front for the time being, there’s this lingering sense that it won’t last for much longer. The members of the Superman art team aren’t being left out of the fun this month, either. Regular artists Pete Woods, Gary Frank and Renato Guedes have matched their writers’ contributions by teaming up on the visuals of New Krypton Special. The three do have uniquely individual styles, but share enough similarities to remain compatible under one roof. 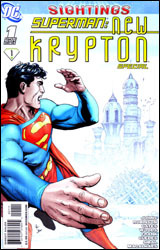 None really pick up the ball and run with it for any length of time, and they’re each given one or two potentially impressive splash pages apiece to do just that, but they at least manage to keep the story moving and lend identity to both the new Kryptonian city and its residents. This isn’t a gorgeous book, but it’s not an ugly one, either. The point of this issue is to catch the casual reader’s attention and get them interested in the character’s next big event, and in that regard it’s successful… assuming that market even gives it a chance. The Superman family is blessed with a trio of writers with strong concepts, a good sense of direction and the motivation to get it where it needs to go. New Krypton Special asks plenty of compelling questions, and for once I’m not really sure how it’s all going to pan out. It’s a good start, and it deserves your attention if not your dollar. Borrow it if you can – this isn’t the same old lukewarm, complacent Superman I was expecting.